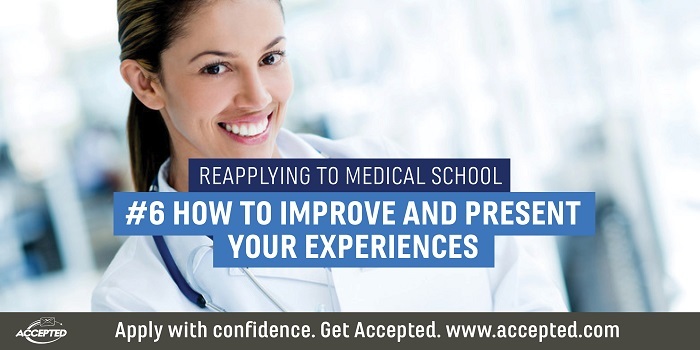 In the final section of our Medical School Reapplicant Advice: 6 Tips for Success series, we’ll discuss how reapplicants should improve, and then present, their experiences. One last factor that can seriously hurt your chances is a lack of substantive, ongoing experiences. It’s hard to convince an admissions committee that you want to pursue a medical career if you haven’t spent time in a clinical environment. Shadowing can give you a peek into that world, and it is a wonderful way to learn about the different specialties. But to demonstrate the kind of ongoing, substantive involvement that will make an impact, you’ll need to go further. If you’ve identified clinical exposure as a weak area, the American Medical Student Association’s guide is a valuable starting point. Volunteer at your local hospital or free clinic. Some positions won’t offer much patient contact, but some involve providing patients with pre-exam instructions, entertaining sick children, and escorting patients to various areas. Areas like Surgical Recovery Units and Emergency Departments often allow chances for patient interaction. See what’s on offer. Work as a Certified Nursing Assistant with a nursing home or home care program. Training takes 6-12 weeks, after which you can help in patient support roles. Train and work as an Emergency Medical Technician on campus or in your community. Join the staff at a summer camp for children with disabilities or chronic illness. Listings like Summer Camp Staff can put you in touch. Intern or volunteer with your county health department. Many opportunities will put you in touch with physicians and public health experts, as well as affected populations. See if your hospital offers a Hospital Elder Life Program. They’re often seeking volunteers to work with their elderly patients, as are hospices and nursing homes. Find overseas opportunities. Programs like Gap Medics can help organize placements. Before seeking an overseas position, however, take a look at the AAMC’s guidelines. Gaining substantive, ongoing clinical experience can be challenging, since anything significant requires a medical license. And like improving your study skills, this isn’t something that you can fix quickly. Hopefully any volunteer activities begun before your last application are ongoing – in that case, you’re in good shape to reapply with a stronger application. But it’s important not to rush this step – reapplying before you’ve had time to develop solid experiences could land you right back at the start. As you prepare for your reapplication, try to stay optimistic. What you’ve been through hasn’t been easy – those rejections aren’t good for anyone’s self-confidence – but hopefully you can look back on it as a learning experience. Now wiser and more qualified, you stand a much better chance at getting into medical school. Remember, it only takes one acceptance to become a doctor! Thanks for joining us on our adventure through the med school reapplication process. If you want to improve your chances of acceptance even more, take advantage of Accepted’s application review service to get a tailored assessment of your strengths and weaknesses. 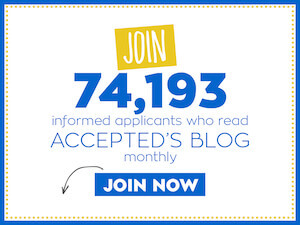 • How Important is Volunteering for Medical School Admissions? Last updated on March 20, 2019.